1 - All pillows seem the same. How can you tell the difference between good and bad products? Indeed, at first glance, pillows are very similar, but, in reality, there are many differences among them. The fabric that lines them, the raw material used for filling ant the treatments the products receive make a big difference. Good pillows provide support to your back (neck), adjusting to the size or format of your head and neck. This adaptability and comfort varies from person to person according to each one’s specific needs. For such, Plooma has pillows in various sizes and several types of filling. feathers, goose down, feathers and goose down, Fiber Ball polyester, Visco Elastic and Latex, as well as antimicrobial treatments, which ensure sleep without allergies. 2 - When should I change my pillow for a new one? Health professionals recommend changing your pillow every 2 years. 3 –How can I maintain the volume and softness of Feather and Goose Down pillows? After daily use, softly fluff the extremities of the feather and goose down pillows, helping the item recover its natural state. This habit helps conserve the product. If the pillow looks “flat”, just leave it in the sun or dryer. 4 -Is allergy to feathers and goose down very common? Although many people believe they are allergic to feathers and goose down, allergies are not caused by the feathers or goose down, but rather by the residual dust (mites) the pillow may have when these products have not undergone antimicrobial treatment. Plooma guarantees that its products are Hypoallergenic, because it uses the Ultrafresh antimicrobial treatment. 5 – What type of polyester is used in Plooma products? There are many types of synthetic fibers used for filling pillows and quilts in the market. Plooma uses siliconized Fiber Ball polyester fiber, with a rounded shape and high resilience (after use it easily returns to its original shape). It is very flexible and soft. Products made with Fiber Ball polyester are easy to wash and dry, while also having good capacity for recovering the initial volume. It provides the pillow a very soft feel. 6 - What is Plooma’s Downproof Nomite fabric? This is a fabric especially developed by Plooma with international NOMITE certification, 100% cotton fibers, supercal 210, 240 and 280 threads. The weave of this fabric is sufficiently closed to impede the passage of feathers and goose down (leaking) and open enough to enable the natural breathing of the skin. The fact the weave is very closed also impedes the migration of mites. 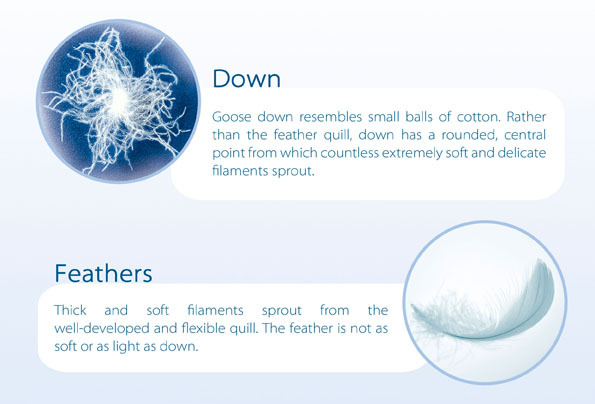 7 – What is the difference between Feathers and Goose Down?